Thanks for the contest. I would like to win the camera. Please enter me. I’m a subscriber who diligently reads your newsletter. Great stuff!!! I have a Nikon D70 which is a toddlers toy compared to this one! Thank-you for the chance to win an upgrade. You have a wonderful website!Thanks for the help with all the researching that you do. This camera would be great for me to take photography back up! Already a subscriber here. This would be nice, my son asks me why our camera takes such bad pictures. Holy mackerelly! I wanna win dat! Very nice prize, hope I win! I’m a subscriber and love that camera. Please accept my entry. Thank you. I’ve been a subscriber for many months now. I don’t own a good camera so, would love to win this one. I never treasured the gift of photos until I lost my 15 year old daughter in auto accident. I wish I had taken more photos while she was with us. My camera is so old, I should donate it to a museum. Great prize in time for the holidays. Happy Holidays all. I’ve always wanted a DSLR camera. Nikon is known for its quality. Make me a winner. I would love to win this camera. My son needs a new camera for a graphics class he will be going to at college. He has no idea how he will come up with the money, so I was trying to figure out if I could help him. This would be just the answer for us! I am a subscriber and would love to win something this cool. I love taking pictures and have to make do with the old one I have. This was the exact camera I have been looking for! What a great contest. Happy holidays. Am a subscriber, please enter me into the contest. Time for a cmera change. This would make the perfect Christmas Gift. I am a subscriber and I would like to be entered in this drawing. Thanks. 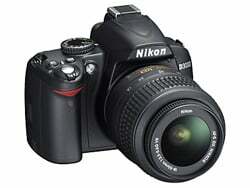 Nikon D3000 Digtal SLR, Picture Perfect. Thank You for this Awsome Opportunity. I am a subscriber and would like to be entered in your contest. I am a subscriber. I would love to win this camera! Great contest and camera—just subscribed! I am already a newletter subscriber and I would love to be entered into the contest. Its better than my point and shoot camera. Oh man, would I love to win this great camera!